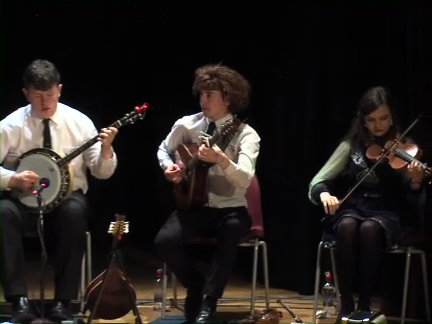 Macalla na hÉireann, Comhaltas Concert Tour of Ireland 2017, musicians and dancers with a selection of Reels, commencing with “Anna’s 40th” composed by Jody Moran, which won 1st place in Newly composed Tunes competition at Fleadh Cheoil na hÉireann. Recording was in Brú Ború, Cashel, Co. Tipperary on 20th October 2017. Dancers - Leona Bowe, Ciara Horan, Chloe Feeney, Mairtín Ó Cathasaigh and Davog Frayne. Musicians - David Vesey, Chloe Feeney, Niamh Mc Gloin, Ryan Hackett, Cillian Roche, John McCann, Shane Scanlon, Tadhg Mulligan, Aisling Murphy, Davog Frayne. Singers Vera Barrett, Mairtin Ó Cathasaigh. Fear a’ Tí - Dic Beamish. Show Producers - Niamh O’ Sullivan and Cian Kearins. Tour Manager - Eddie Murphy. Tour Co-ordinators - Bernard O’ Sullivan and Siobhán Ní Chonaráin. Graphic Design & Photography - Fernando Marcos.